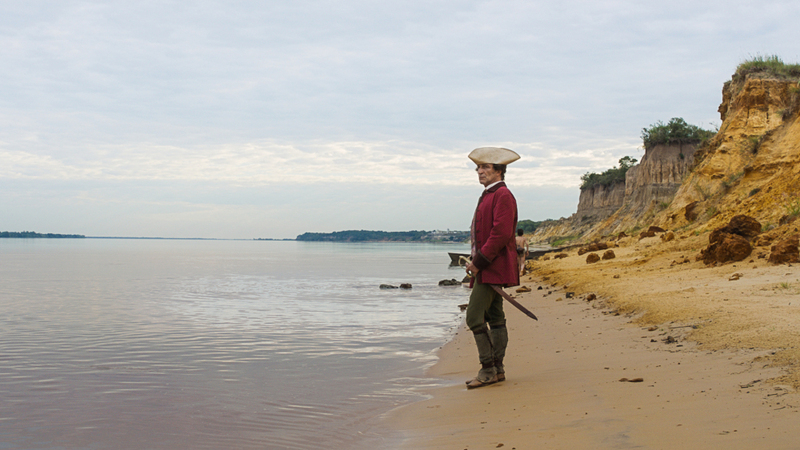 “Zama” opens with its eponymous 18th century character, Don Diego de Zama (Daniel Giménez Cacho), magistrate of an Argentinian outpost of the Spanish Crown, standing on a beach in full regalia, tricorne hat, coat, and pantaloons. 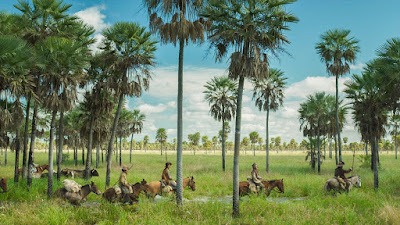 Director Lucrecia Martel, however, frames it so as to remove any triumph, keeping the camera at a distance so rather than Zama looming large it looks like the landscape looms large over him. Native kids run around in the background, interfering with his would-be over-the-mantle portrait, an idea Martel returns to visually throughout, always squeezing Zama out of his own frames, with animals and people popping up in the background, as if he is just passing through rather than standing firm. It is a witty tone-setter, a movie of scathing satire and remarkably dry humor equating colonialism with tourism, underlined by the occasional notes of slack-key guitar, like Zama is descending the stairs from a Honolulu plane. Indeed, “Zama” is less period adventure than vacation from hell comedy. And rather than having to prop up a dead body, like “Weekend at Bernie’s”, Zama may as well be trying to prop up his own disintegrating spirit. The eponymous magistrate’s desire for a transfer to another South American outpost drives “Zama” in so much as its plot drives anywhere, more concerned with the effects of stasis than any sort of forward momentum, generally eschewing a traditional narrative for a series of episodes instead as a means to evince the effect of time both standing still and just wasting away. “Zama” stretches out over years and takes place in three different time periods, though Martel forgoes chapter headings, preferring to let these different eras just bleed into one another so the viewer just sort of suddenly realizes they have skipped ahead after it’s already happened, brilliantly eliciting the effect of life having slipped by. It is a boundless sensation encapsulated in an early scene when a native child being carried in a chair suddenly floats into the picture just behind Zama’s head, whispering that the Spanish representative is a “a god who was born old and can’t die.” The child continues: “His loneliness is atrocious.” You hardly know if this is real or hallucination, though the way Zama reacts, looking very much like the man this child has just described, suggests that even if he’s hearing voices, he knows they speak truth. In a movie of myriad cruel, quiet jokes, perhaps the biggest is on Zama himself, a character easy to loathe and sympathize within the same moment, an 18th century middle manager who is neither at the top of the Crown’s food chain nor at the bottom, denied his precious transfer because of his superiors’ thoughtlessness even as he issues thoughtless orders in regards to those below him, feeding straight into an indeterminate loop that he remains oblivious to even as he simultaneously seeks to escape it, the result of the system and its arbiter. He is a man of incongruity, writing letters home to a wife who never answers even as he tries to make time with a local noblewoman, Luciana (Lola Dueñas), who openly flirts with him and then resists when he tries to act on her flirtations. In these scenes, as in a later one across from the daughter of a couple original settlers, Giménez Cacho does not look at these woman so much as unabashedly, ravenously undress them with his eyes, a desire so nakedly pitiful that it becomes comical. The scenes with Luciana not only further Zama’s ineffectuality, metaphorically or otherwise, but evince how brilliantly Martel lays out the ecosystem of colonialism without necessarily calling attention to it, illuminating the way in which it was so effortlessly baked into the society. As Luciana and Zama banter, a slave stands dutifully, if tiredly, in the background, tugging the rope connected to the 18th century ceiling fan above, each pull yielding a squeak that becomes the deliberately annoying soundtrack to the entire sequence. These slaves are never glimpsed outside of being forced to perform their tasks, yet frequently in shots Martel allows them a kind of release anyway in the form of bemused facial expressions as they endure the evident idiocy of their oppressors. It is the darkest of comedy but also an improbable, instant sketch of something like emotional liberation, demonstrating that their souls remain intact. Zama’s soul, on the other hand, is out to sea. If years pass and run together as the movie progresses, he seems to grow not only older but more sickly. In another indelible frame, sill and hardly able to move, he is stripped naked and washed as a mother stands in the upper right-hand corner of the shot holding her young, naked infant, equating this nominally important magistrate with a child. As his dream of getting out grows ever more elusive, he can hardly bring himself to go through the motions, and so when, in a cruel punchline, he is denied his transfer yet again, he volunteers to help track down a legendary native bandit named Vicuna Porot.